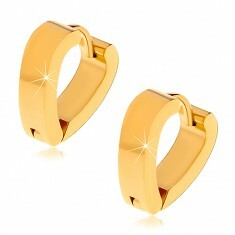 Your favorite product: Puzetové steel earrings gold color, ring with sandblasted surface AA05.02 - is added to the wish list. Earrings with puzetovým stainless steel, steel 316L, matte flat ring, a glittery sandblasted finish, golden hue. Your favorite product: Earrings made of surgical steel gold color, the outlines of the lozenges, hooks X09.14 - is added to the wish list. Steel earrings in a golden hue, the contour of a rhombus with internal lines, african hooks. Your favorite product: Steel earrings with four čirými cubic zirconia in the shucking, and with bands of gold color Z44.02 - is added to the wish list. 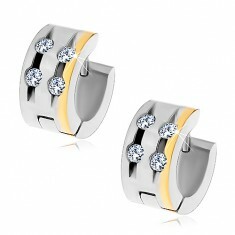 Two-tone articulated earrings from surgical steel, set four clear cubic zirconia and a single stripe in a golden hue. 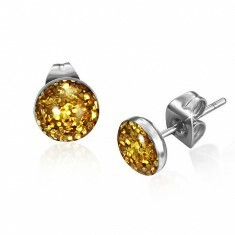 Your favorite product: Steel earrings with římskymi digits W17.24 - is added to the wish list. 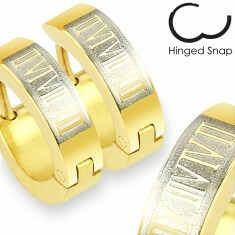 Steel earrings gold color with a pattern of roman numerals. Your favorite product: Steel earrings in the shape of a heart, a golden hue, the articulated fastening X04.17 - is added to the wish list. Articulated earrings made of surgical steel in gold color and in the form of a broad heart, a glossy smooth surface. Your favorite product: Earrings made of steel 316L golden color with a hanging cross, the articulated fastening X07.07 - is added to the wish list. 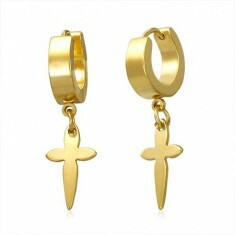 Steel earrings - rings with a hanging cross, gold color. 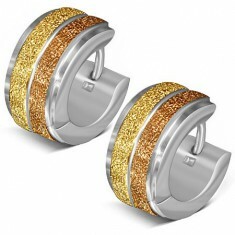 Your favorite product: Steel earrings with gold glitter in a circle with a glaze of X21.11 - is added to the wish list. Puzetové earrings made of surgical steel with a circular banner covered with golden glitter. 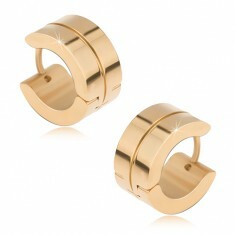 Your favorite product: Fake steel ear piercing gold color, rubber bands AA4.28 - is added to the wish list. 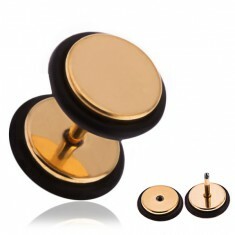 A round fake ear plug made of steel in a shiny golden finish with PVD coating. Your favorite product: Circular steel earrings gold color three round clear rhinestones S14.16 - is added to the wish list. Earrings made of surgical steel, small rings decorated with three čirými round cubic zirconia. 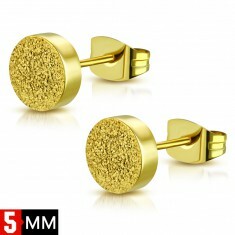 Your favorite product: Circular stud earrings made of steel golden color, shiny, thin furrow S15.12 - is added to the wish list. 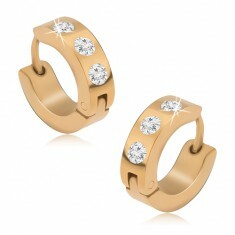 Shiny steel earrings, rings with a narrow notch around the perimeter, golden color. Your favorite product: Circular gold earrings made of steel, a raised sanded belts, glossy center Q21.18 - is added to the wish list. Steel earrings, round, gold finish, curved center bar, protruding sanded the edges. 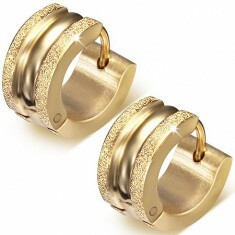 Your favorite product: Gold sandblasted earrings of steel, the sloping edges of the S22.20 - is added to the wish list. 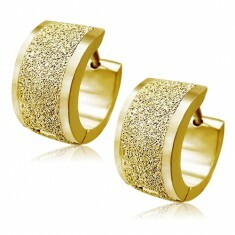 Circular steel earrings gold color, sandblasted surface, beveled edges. Your favorite product: Circular stud earrings made of steel, the two sandblasted gold belts S25.16 - is added to the wish list. Circular steel earrings, two protruding sandblasted stripes of gold paint. Your favorite product: Pendant surgical steel gold color, gravírovaná contour of the heart S24.16 - is added to the wish list. 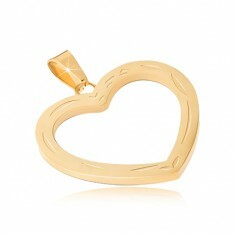 Steel pendant, shiny surface, golden color, the outline of the heart, and engraving. 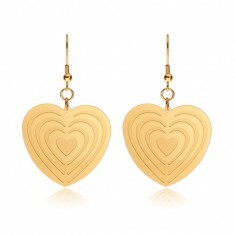 Your favorite product: Steel earrings gold color, symmetrical heart with notches S28.18 - is added to the wish list. Padlock shiny gold earrings made of surgical steel, symmetrical hearts, notches the contours of the hearts.